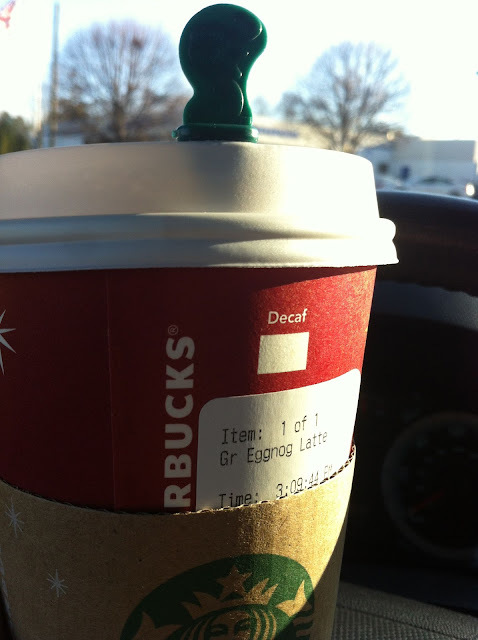 This is a Grande Eggnog Latte. And this afternoon, it helped me. Lattes bring great clarity, don't they? You know what? I would love to sit across the table at Starbucks with each and every one of you. I would thank you for stopping by this space, for following along with our story, for cheering me on. I would listen as you shared your story - I would love to know each one of you, and connect with you. What is it that brings you here? What keeps you coming back? What can I do for you? I started blogging a long time ago because I heard about it, and I thought it sounded cool. I've always enjoyed writing, and I've always been the storyteller in any group. Blogging was a perfect fit for me, from the start. I would just share random pieces of my life that for some reason, people found interesting. But, a couple of years ago, things changed. Well, my entire life changed, actually. I moved, changed jobs, got married, and became a caregiver. It's hard to blog, and not be authentic. So, my blog got kind of silent while I went through a really tough time in my life. I searched high and low for other people who were feeling just like me. I looked on Spinal Cord Injury forums and Caregiving forums, but I had a hard time finding people I could really connect with. People who were just like me. So, I just started sharing my heart here. And now - even though life is still sometimes still overwhelming, I know that I know that I know that I am not alone. And it gives me such joy every time I get an e-mail or a Facebook message or a Tweet from one of you who say you so connect with what I write here that you feel like you could have written it yourself. What a privilege to have found all of you. I've said before that I have big dreams for this blog. One of those dreams is to take the community that's been built in my inbox because of this blog, and turn it into a yearly get-together for couples like us - living Love Like This. Because bless their hearts, other people can only get this so much. I don't mean to alienate anyone who isn't in our little club! I love ALL of you who take the time to read this and care about us! But I feel in my heart that this is what I am supposed to do with this space - bring couples like us together. We can encourage each other and learn so much from each other. I want us to all be friends. I want us to all get together. That yearly get-together-in-person thing may still be a way's off. But for now, let's connect where we can - Facebook! I've created a Facebook Group that is born of the community that's been built because of this blog. It's called Love Like This Group, and if you're interested in joining, I'd be so happy to have you! I'm serving virtual Eggnogg Lattes. I come to your blog bc I am nosy! Reading ur blog is like reading a novel. One that I can relate all while learning new stuff at the same time. You see, ur the main character and ur job is the part of the story where I am introduced to ur expertise in news/production/politics. I like learning so that intrigues me. Ur dry sense of humor, ur AB/Dis relationship is familiar to me which is comforting beyond words, the fact that we are the same, same major, both OCD, both work 2 jobs, both married to c5/c6 quads, both Christians makes me like youI come to your blog bc I am nosy! Reading ur blog is like reading a novel. One that I can relate all while learning new stuff at the same time. You see, ur the main character and ur job is the part of the story where I am introduced to ur expertise in news/production/politics. I like learning so that intrigues me. Ur dry sense of humor, ur AB/Dis relationship is familiar to me which is comforting beyond words, the fact that we are the same age, same major, both OCD, both work 2 jobs, both married to c5/c6 quads, both Christians makes me like your Character. And yes, I do realize you're not really a character but rather, a real live person :-) the fact that you like to cook and you save money much better than I do Those are parts of you that I admire and hope to be, more like. i also enjoy when Mike posts on here from time to time and that you have given Brokaw his own Persona. There is nothing that you need to do for me. Keep being you. Don't ever do this blog out of obligation or pressure.